I thought that this month I had already reached my quota of being a crafty mom. After all, I’ve already made a reusable sandwich wrapper and hobo dance bags for the girls! 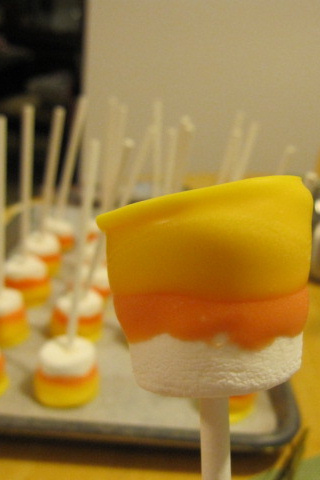 When I saw these cute Halloween treats on Pinterest, however, I knew I had to make them! This recipe comes from Food Family Finds. I found cookie sticks, clear treat bags and white candy melts in the craft section at Walmart. Walmart’s selection wasn’t huge, and I had better luck finding the rest of my supplies in the candy-making section of Hobby Lobby. They had yellow candy melts and the candy coloring, along with the fancy twist ties. I bought regular sized marshmallows at Jewel. I was hoping to find the giant marshmallows I had seen this summer, they were no where to be found on this shopping trip! 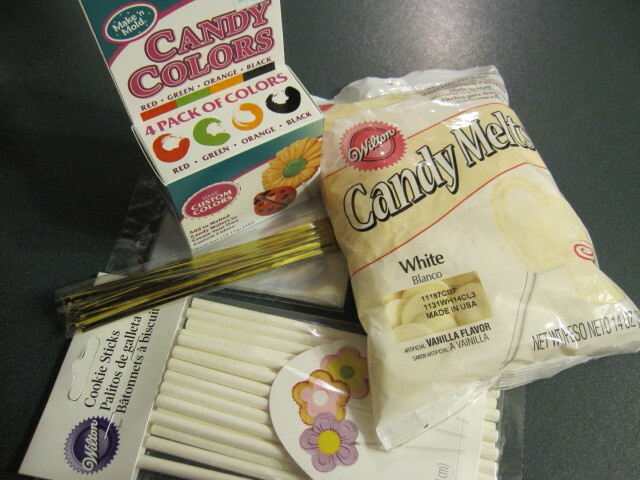 Using the orange candy coloring to dye the white candy melts, I also added a tablespoon of Crisco for each 1/2 cup of candy melts. It melted very nicely in the microwave, and I dipped the marshmallows two thirds deep into the candy. I placed the marshmallows on parchment paper to dry. After the orange candy was completely hardened, I repeated the process with the yellow candy melts, dipping the bottom one-third of the marshmallow into the candy. 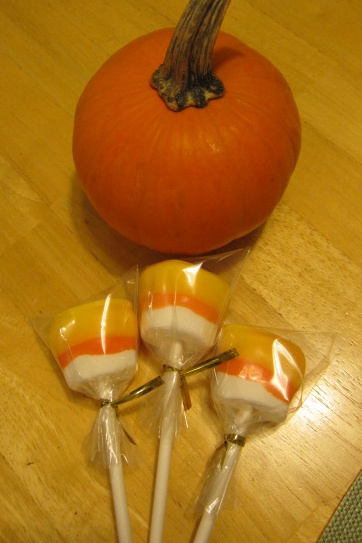 Bagged and tied for a cute Halloween treat! I brought these treats to a Halloween luncheon one of my friends hosted for our preschool class and their moms. The treats were a huge hit! Plus, since I had put them in little bags, the kids could take one home with them. Such an easy treat to make! 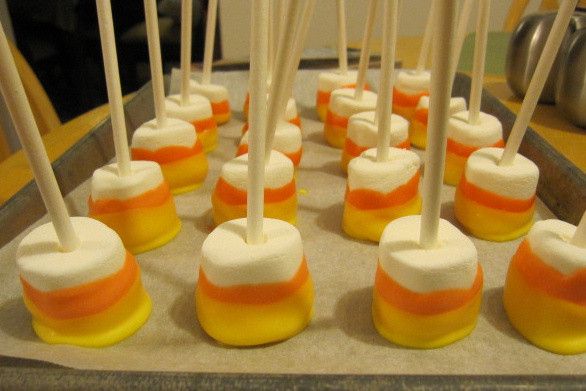 What treats are you making this Halloween? I love crafty people. It's just not in my DNA, but oh how I love to see the creative come into form. These are very cool. How cute! Since we've gone nonprocessed, we're not making a lot of treats, but these are so adorable, and it looks like a fun project for Sprite. We may just do these for her class. I think looking at them must be amost as much fun as eating them! They look awesome, you did great! Oh, wow, those look amazing! What an adorable idea! I am going to make a bouquet of them for G's teacher!